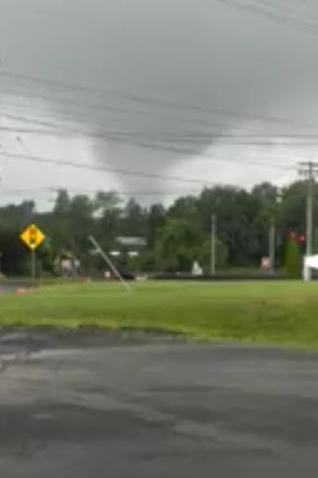 A tornado touched down in Greenwich and Stamford Monday morning and the same storm produced another, stronger tornado in the afternoon in Windsor, Windsor Locks, and East Windsor. This mini supercell was long lived. It produced a 4.8 mile EF-0 tornado in northeast New Jersey northwest of Newark Airport around 9:20 a.m., a 3.7 mile long EF-0 tornado in Greenwich and Stamford, and an EF-1 tornado in Windsor, Windsor Locks and East Windsor around 1:30 p.m. This is how the Windsor tornado looked on storm relative velocity from the KBOX radar. You can see a briefly impressive couplet with 60 knots of gate-to-gate shear for one volume scan over Windsor/Windsor Locks right over the Bradley Connector. In this case the red shading are winds blowing to the west while the green shading is wind blowing to the east. Where the two meet is, in this case, a tornado vortex signature. The tornado warning from the National Weather Service was issued at 1:31 p.m. following the 1:27 p.m. volume scan. 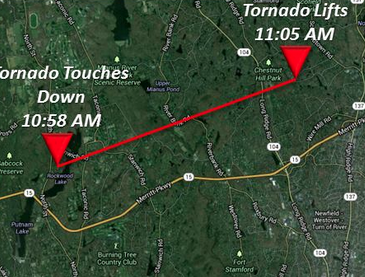 The touchdown likely touched down around 1:27 p.m. on the Windsor/Windsor Locks line just east of Poquonock. 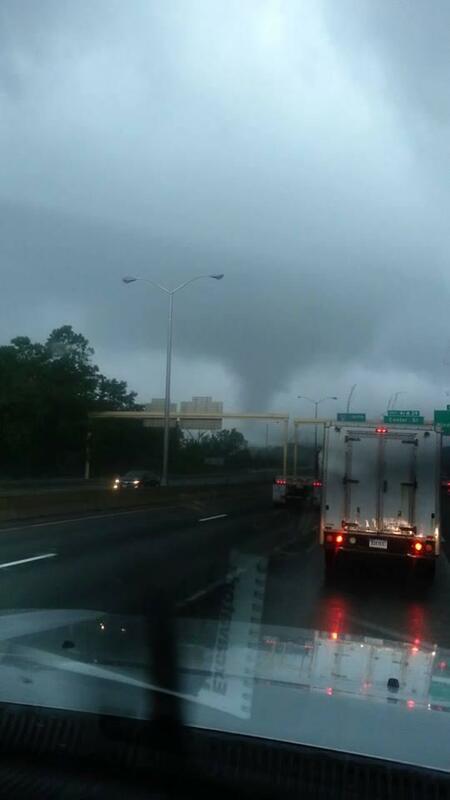 The tornado moved across I-91. It’s all but certain there was a touchdown based on damage reports, video of the tornado, and the radar signatures here. Here’s a picture from Windsor where a roof was ripped off a business on Hayden Station Road. 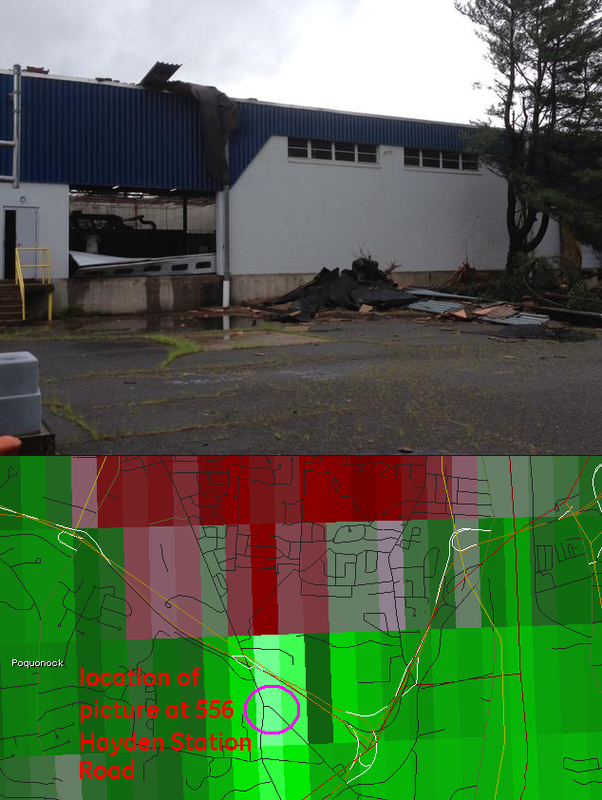 This picture corresponds to when the velocity couplet on radar was strongest at 1:27 p.m. This appears to be near where the tornado first touched down. The tornado touchdown was very close to where the radar showed the strongest rotation (at 6500′ AGL). Tornado damage occurred just 0.40 nm south of the couplet. No surprise that there was a slight offset as the updraft can be tilted and/or the resolution of velocity data is a bit coarse at this distance. The weather pattern was supportive of tornadoes in Connecticut today. High-end tornadoes from supercells are rare but do occur with large, powerful, and tall thunderstorms here in Connecticut. Those are the storms like June 1, 2011 in Springfield or July 10, 1989 in Hamden that drop monster hail and have deep and powerful updrafts. Just as common in southern New England and Long Island are mini supercells that develop in a highly sheared and very tropical airmass. These mini supercells can be quite shallow (i.e. not tall) and can drop brief tornadoes. 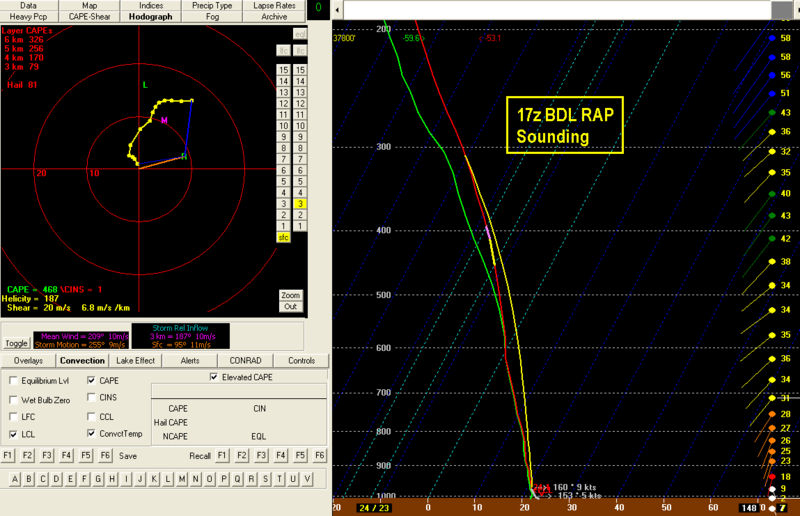 Here’s the 1 p.m. proximity sounding from the RAP model at Bradley Airport. This is a classic mini-supercell sounding and hodograph for one of these events. Winds at the surface were backed ahead of the storm (notice the southerly and southeasterly winds near the ground), lifted condensation levels were incredibly low (700-800ft AGL), and there was approximately 500 j/kg of surface based CAPE with no CIN or low level inversion. The hodograph shows sufficient shear in the 0-1km and 0-3km for tornadogenesis. This occurred in a highly tropical atmosphere (PWAT values in excess of 2.00″) and on the northern tip of a developing and northward moving low level jet. The nose of that low level jet produced a long enough and clockwise turning hodograph (indicative of large vertical wind shear has shown above) in the lowest 2 km of the atmosphere to support tornadoes. The top of this minisupercell was only about 35,000 feet high (unimpressive by thunderstorm standards), the storm produced little lightning, and the mesocyclone was only evident below 10,000 feet. Here’s a reflectivity loop (click to animate) showing the tornadic storm near BDL and an earlier storm near Agawam that exhibited some weak rotation produced 2 significant microbursts with hundreds of snapped/uprooted trees. This area is no stranger to tornadoes. One of the most violent tornadoes to hit the state since the 1878 Wallingford tornado did so in Poquonock, Windsor Locks, and Suffield on October 3, 1979. 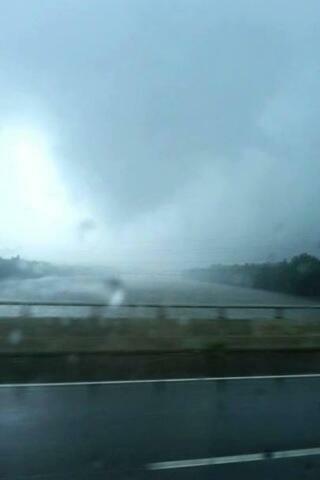 Here’s a picture of the tornado going over the Connecticut River. How many of these are we going to see (remember West Springfield-Springfield in 2011???). Here’s another picture from I-91 looking north. 91 from Windsor to Springfield is our new little tornado alley in New England I guess. Originally some of the YouTube videos I saw of the tornado looked like there could have been a smaller rope tornado wrapping around the larger vortex but not so! 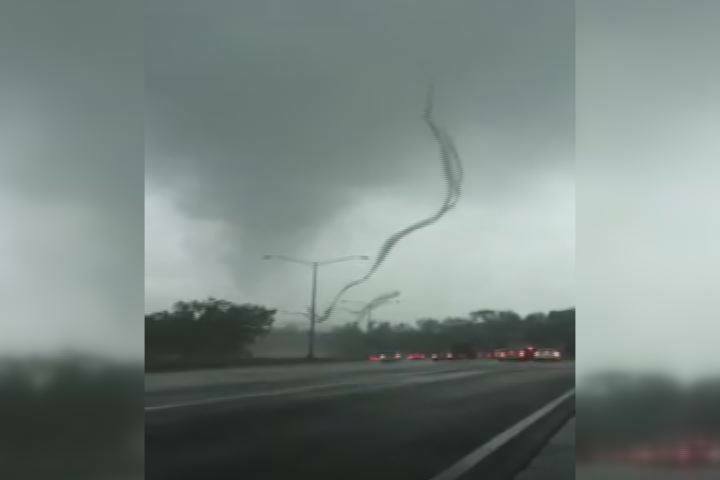 My friend John Bagioni pointed me to a better video that’s close up and you can see what looks like a small “rope” tornado is actually nets from tobacco fields getting spun around the storm. For what it’s worth – here are the observations from Windsor Locks and Hartford (Brainard) around the time of the tornado touchdown. You can see that around 1:10 p.m. the winds at Bradley (northwest of where the tornado would touchdown) were out of the north while the winds south of the storm were out of the SSE. That slightly backed flow (SSE or 160 degrees) resulted in an area of rich helicity/low level shear that is confirmed by the 17z proximity RAP sounding at BDL I posted about. The “ground truth” obs match the 17z model analysis. The earlier tornado in Greenwich and Stamford was weaker than the Windsor storm but resulted in widespread tree damage north of the Merritt Parkway. 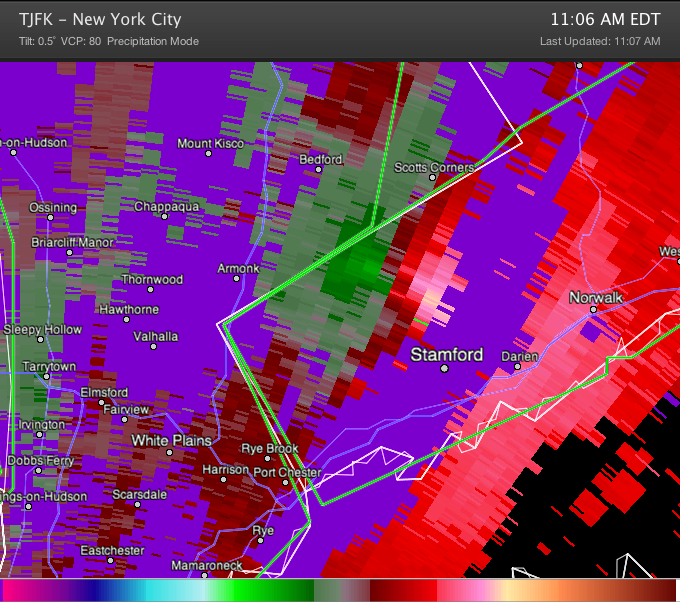 This is the first tornado in Greenwich since the 2006 F2 tornado that tracked from Westchester County into Greenwich. This tornado was spawned from the same mini supercell that produced a tornado in northeastern New Jersey earlier in the morning. The rotation was impressive on doppler radar. Here’s a look at the TJFK TDWR. In the grand scheme of things we’re fortunate that this tornado didn’t become a long-track tornado. There are some similarities between this tornado and the 2008 EF-2 New Hampshire tornado that was on the ground for 52 miles with a continuous damage path. The total for 10/29 is 12.3″ with additional snow after 1 a.m. on 10/30 that is still unclear. If I had to guess I’d say the 12.3″ measurement is a hair on the low side based on some problems with how the measuring was done. The guys at Bradley do the best they can but unfortunately measuring snow properly is not easy. The additional snow from 10/30 will be added to the climate data in the coming days after the NWS does a bit more investigating. We will likely end up with an official total around 14″ though I think the actual total was about 1″ or 2″ higher. It’s been one crazy year. Arguably 2011 has been the most wild year of southern New England weather in many, many years. The October 29-30 snowstorm is the most memorable snowstorm of my lifetime for a whole host of reasons. It’s also one of the most anomalous storms I can think of in Connecticut. We get tornadoes, hurricanes, and ice storms every once in a while but the October snowstorm was absolutely unprecedented. So the question remains – how much snow actually fell. The observation that came in from the official climate site in the greater Hartford area at Bradley was 20.3″. That’s too high. The National Weather Service has removed the observation pending further review. It’s important to know the official way to measure snowfall to make sure we’re not comparing apples and oranges. Many people think total snowfall is just sticking a ruler in the snow at the end of the event and seeing what’s on the ground. That’s snow depth… not total snowfall. The correct way is to measure on a white of light colored board (piece of plywood is fine) and away from any obstructions like trees or your house. After the first flakes fall you should measure and clear the snowboard every 6 hours and/or when the snow ends. In certain cases clearing a snowboard can result in higher totals when there is significant compaction (a fluffy snow) or significant melting (when temperatures are above freezing). Based on the neighboring snowfall reports I have a hard time in buying the 20.3″ measurement at BDL. Our observer in Collinsville is meticulous and accurate and I doubt Windsor Locks was able to accumulate more snow than Collinsville. In fact BDL likely saw 1″-3″ less than Collinsville did. My guess is that BDL picked up 15″-17″ of snow from this event if “correct” clearing protocols were followed. The maximum snow depth may have only been about 14″ from the storm. Still, 17″ of snow would be a top 10 snowstorm for the greater Hartford area. The old October monthly record of 1.7″ has been shattered by an exceptional margin. In fact the earliest 6″ snowstorm prior to October 2011 in Hartford was November 11-12, 1987!!! !